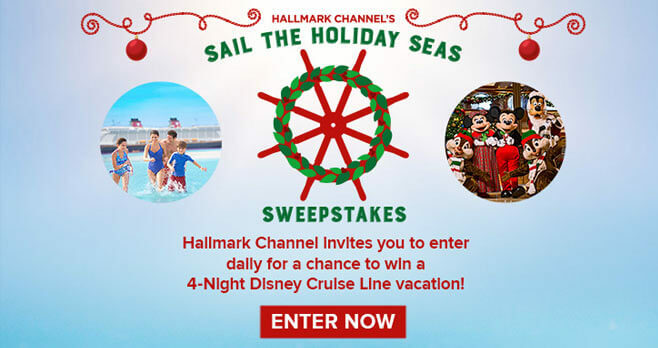 In July, Hallmark Channel is giving away a 4-Night Very Merrytime Cruise for four to The Bahamas aboard the Disney Dream with the Sail the Holiday Seas Sweepstakes. Register during Hallmark Channel’s Christmas Keepsake Week for your chance to win. Ends: Ends at 8:59:59 PM PT on Thursday, July 26, 2018. Prize: The grand prize winner will receive a 4-night Bahamian Disney Cruise Line trip for four to be taken aboard the Disney Dream. Eligibility: The Hallmark Channel Sail the Holiday Seas Sweepstakes is open to legal residents of the 50 United States, including the District of Columbia, age 21 or older at the time of entry.